Barrier - I don't have a good body shape and I'm conscious of how I look when I exercise. There is no 'perfect' body, so don't look for one. Do not compare your body with the other person. Each person is unique and different. Start working out solo till you get used to exercise. As you become healthier, your self-confidence also might improve. Be grateful for what you have and work towards better health, not better shape. Barrier - I used to exercise some years ago and I lost weight. But when I stopped exercising I put on weight. I don't want to go through that process again. Exercise is not only for weight loss but overall health as well. So, don't exercise with only weight loss as your goal. Start slowly and gradually increase time and pace. Keep at it regularly till it becomes a habit which is hard to break. 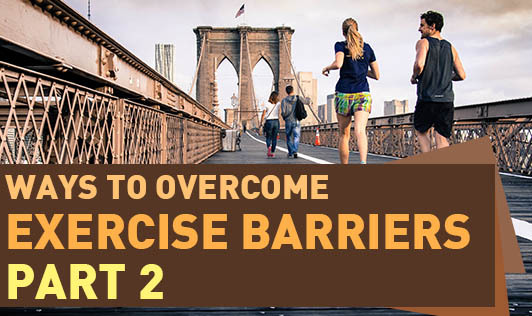 Barrier - I cannot afford gym membership or expensive equipment. Go for a walk in your area or a nearby park, or practice yoga (needs no equipment other than a mat), or use basic household gadgets for strength training, or climb up and down the stairs many times. There are several exercise programs on television and internet. Try to follow one of them. Do household work (sweep, mop, dust, wash dishes, etc. ); it's an excellent way to exercise. Barrier - Weather is not suitable and I get an allergy in the morning. If the weather is not conducive to outdoor exercise, do it indoors. Play an indoor game, walk in an enclosed area, visit the gym or do yogasana. Meet an allergy specialist and get the problem treated so that it doesn't hinder your exercise. If you have to go out in bad weather, dress suitably to protect you from falling ill.
All individuals who are less than 90 years of age OR are not bed-ridden need to be physically active. So get up and move!